It is a well-known fact that water boosts brain function. Yes, that satisfying crystal clear neurological nectar has played a role in countless moments in history; political decisions, life changing inventions and genius ideas. Well, what did you think Ozzy was sipping when penning Black Sabbath’s way to the top of the charts week after week? Another wonderful creation that has arisen purely from a bountiful spring of the wet stuff is Hotel Royal. Yes, this 5* temple to the Belle Époque was the brainchild of the Evian Mineral Water Company, who commissioned the hotel back in 1905 and later dedicated it to King Edward VII – once destined to stay but he died before he could make the trip. 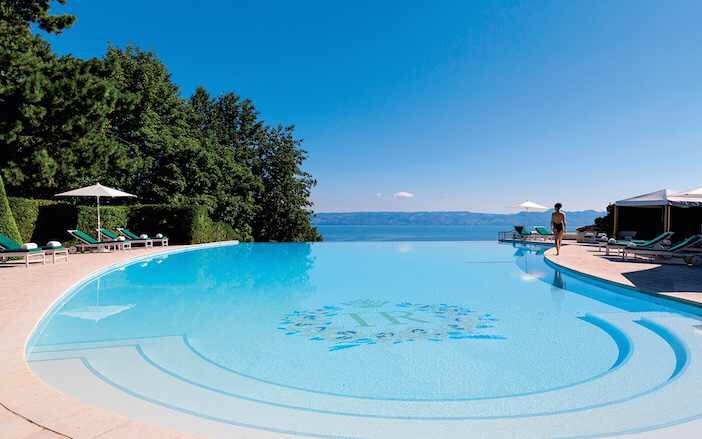 The hotel, which from the outside is somewhat reminiscent of a swish ocean liner, is anchored almost 500m into the foothills of Lake Geneva, keeping watch over the vast lake and that all too familiar Alpine range which graces every bottle of Evian you’ve ever laid eyes on. Despite Edward VII not managing to make the voyage, the iconic hotel has set the scene for countless royal, political and aristocratic meets and even hosted the G8 summit – well, with such big decisions to make they needed somewhere with lots of world class water on tap, didn’t they. Despite making it through WW1 as a luxury hotel, WW2 took its toll and it temporarily became a rest home for Italian and German officers and convalescing Americans before re-entering the hospitality scene. 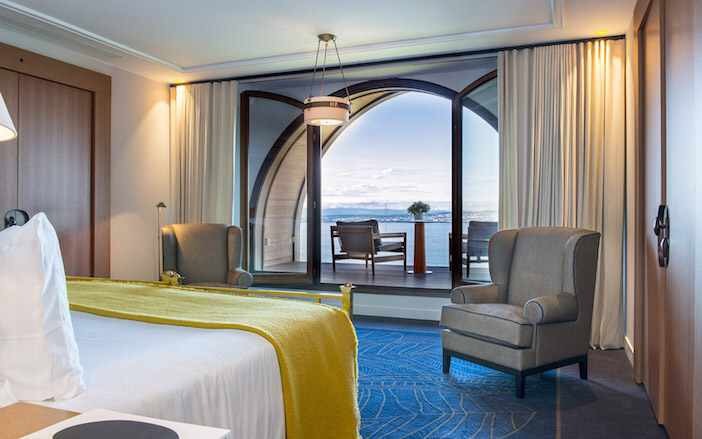 Last year, following an extensive refurbishment, the hotel entered a new era, one which sees contemporary design statements injected alongside its timeless vaults, domes and frescoes. Luckily, thanks to the precise inventory list created by German and allied forces, much of the hotel’s original furniture and features remain, creating a wonderful blend of tradition and modernity in each room. Having battled our way through rush hour in Geneva, we finally made our way over the border in to France, taking in the fairy-tale turrets poking their heads through the forests and the quaint village churches along the way, we finally arrived at the prestigious Evian Resort. Now, I must confess, I am not a resort kind of gal. The idea of communal buffets with a side order of friendly conversation with strangers and enforced fun itineraries bring me out in hives. I needn’t have worried – perching on the very edge of the foothills, staring across the distant desolate lake towards Switzerland with nothing but the Alpine breeze for company, I was in heaven. Hotel Royal feels truly out on its own, yet with the resort’s 47 acres of grounds and world-class facilities it can accommodate every taste or urge you desire – from cookery lessons, golf and paragliding to tennis, helicopter rides and dog sledding – it has the best of both worlds. That evening I hit the sack and dreamt of the delicious crab claw cocktail that I had enjoyed at dinner. I say ‘hit the sack’ like I am a normal, relaxed sleeper…oh no, having rammed my ears with wax plugs every night since I was fourteen I am the most neurotic, fussy sleeper I know. Every night my boyfriend rolls his eyes as I dowse my side of the bed in pungent sleep mist, reach for my lavender scented eye mask, smear aromatic balm all over my nose and any reflex point in sight and neck my camomile tea as I shoehorn the ear plugs in. No, it is not easy to impress me when it comes to a good night’s sleep. However, that night, all alone, in my small but perfectly formed room beneath the snow-covered Alps, I found the one…the pillow of all pillows. It was love. Having awoken from my blissful slumber and spent five minutes dancing around the room and fist pumping the air I put on my serious face and beaconed in room service and the enormous linen clad trolley that displayed my indecisive / greedy breakfast. Every morning of my stay I wrapped up in the hotel robe and pottered on to my balcony to awaken my senses with coffee and fresh alpine air overlooking the lake and listening to the church bells. Yes, this was my kind of resort. Evian-les-Bains is just a short stroll downhill from the hotel, however I couldn’t resist using the traditional funicular which picks you up almost from your door and slides you all the way down in to the centre of town for free. The spa town is of course famous for its water and thanks to the bottling tax payed by Evian to the local council, the 8,600 residents have enough income to accommodate 150,000 citizens by normal standards. This has resulted in a very well-catered-for town with everything from a local polo club to their impressive public baths, where visitors can enjoy a day of spa quality facilities and classes for E30. The water in Evian is so famed for its medicinal qualities that local doctors often shun modern medicine and instead prescribe 21 day passes for people suffering with ailments like arthritis – see, I told you water generates genius ideas. At various points around the town you will see drinking fountains, look out for the ornately decorated ones with queues of thirsty locals waiting to fill up their empty bottles – these are fountains of free flowing Evian no less. Now, I love nothing more than getting lost in a new town, and Evian is the perfect size for this. Tiered over three layers the streets are filled with independent cafes, shops and delis. Tuesdays and Fridays are market day, countless stalls fringe the pretty church selling everything from food and pottery to jewellery and clothes. On this occasion I was led by my nose and found myself at the impressively pungent cheese stalls – you have to try the local Reblochon for a real taste of the region. Well, I figured if I was going to have the best night’s sleep ever here I may as well fill it with cheese-fuelled dreams hey. On my last evening I was invited to dine in Les Fresques. As the name suggests, the elaborate restaurant, like most of the hotel’s ground floor, is adorned with beautiful rustic watercolour frescoes, each depicting a different season. As I sat down I was torn, did I let my eyes indulge in the views across Lake Geneva at sunset, or delight them with Gustave Jaulmes’ ornate watercolours. The answer became clear as the waiter presented me with a large menu with an Alice in Wonderland-esque mirror mounted on the cover. “We created the mirrored menus to allow people to look at the frescoes with ease” I was told. Now there is a well-hydrated genius idea if ever I have seen one. Guests are spoilt for choice when it comes to dining in the resort, but Les Fresques is the jewel in the resort’s crown. Every dish was divine, but the tender blue lobster starter on a bed of fresh crab was a definite winner. However, they saved the best for last as they presented us with an enormous soufflé theatrically served flaming at our table, complete with a gradually melting chocolate plaque proudly bearing the hotel’s initials. As the sun set, the towns on the Swiss side of the lake began illuminating and twinkling in the distance. As I loyally sipped my chilled Evian I had an idea, I should totally book a return visit and I could explore the lake more, oooh and try the caviar body treatment, ooh and the horse riding, oh what the hell I will learn golf if it means I can come back. Genius. Thanks, Evian.